However, I thoroughly enjoyed this chicken recipe. It took me a little bit longer to make than I originally intended, but I’m glad I stuck with it. I got the original recipe here. I will say that this is the first time that I have ever boiled chicken…if I’m completely honest, it was weird. Haha, but it was quite effective and I think it would be good for shredding chicken? (That’s just my guess, I have never tried). Boil raw chicken breasts with salt and pepper until done. Once chicken has cooled slightly, cut into one inch cubes. 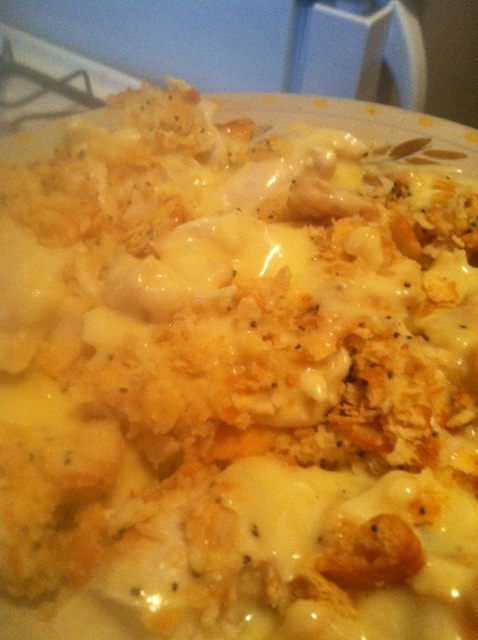 Place cubed chicken in a 9X13 casserole dish. Stir together the soup and sour cream. Pour over the chicken. Bake for 30 minutes in the preheated oven, until the top of the casserole is browned. Serve plain or over rice. Annnnnnd another win! Check me out!